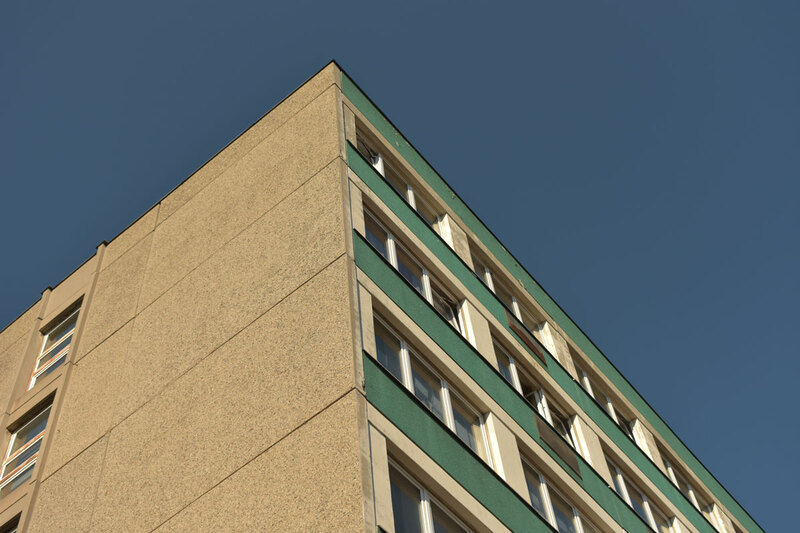 On a recent visit to Berlin I took a photo of a building. I could say I was struck by the contrast between the green panels, the beige concrete and the blue sky, but in truth I was taking photos fairly indiscriminately throughout the trip. The building with the green panels was one of several buildings I photographed. At the time I it little thought. I simply took the photo and walked on. A little further up the road was our destination for the afternoon: Hohenschönhausen. Hohenschönhausen was the site of a former Stasi prison that played a key role in the history of political oppression in the GDR. 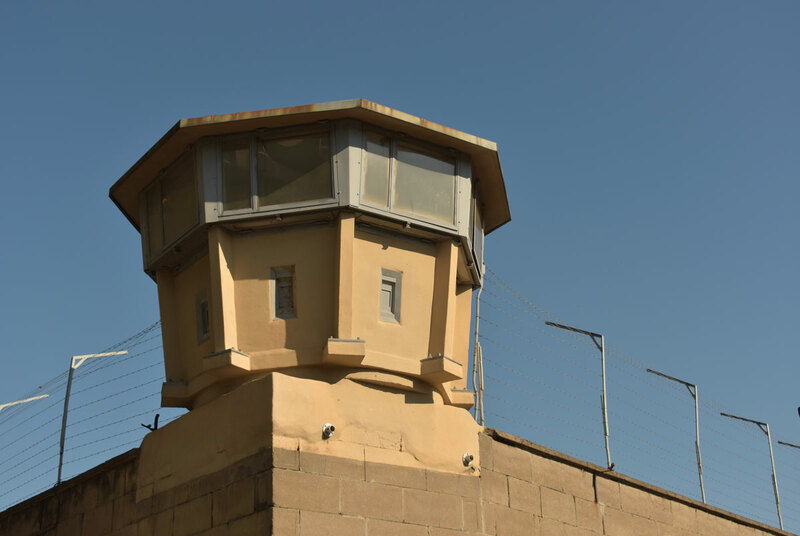 Throughout its years of operation, the prison was concealed within a restricted zone, meaning that no one besides those who worked there knew what it was. Following the fall of the Berlin Wall and the reunification of Germany, the site was founded as a memorial by former inmates and it has been accessible to visitors since 1994. Visitors to the Hohenschönhausen Memorial arrive at a site still flanked by barbed wire, walls and lookout posts. Visitors first watch a short film about the history of the prison before being shown round the site by one of the guides, many of whom are former Hohenschönhausen inmates. As our guide later stressed, Hohenschönhausen is unique as a site of incarceration in that it only ever housed political prisoners, never common criminals. Located in an industrial area of north-east Berlin, the tour started where the prison began in a red-brick building completed by the Nazis in 1939 that was originally used as soup kitchen for workers in the local area. The building only became a prison at the end of World War II when the Soviet Secret Police used the site as a detainment and transit camp. Initially, the Soviets used Hohenschönhausen as a place to hold Nazis ahead of prosecution, but as the forces that would form the Cold War jostled for position across the streets of Berlin, the prison soon housed those whose political dispositions might prove an obstacle to the establishment of a communist state. Led by our guide we were taken into the basement of the former soup kitchen, which the Soviets converted into a series of underground cells that came to be known by the inmates as the “submarine”. Cells were small, dark and cramped, with nothing but a wooden bed for sleeping and a single metal bucket for calls of nature. The only light came from a small bulb above the cell door. It was kept on 24 hours a day. Standing in the dank air beneath the low ceiling, our guide calmly talked us through the horrors meted out in the submarine: beatings, solitary confinement, torture. At one point she indicated where special standing cells had been constructed, narrow spaces so small that prisoners had to remain on their feet, unable to sit or lie down. She said prisoners were often left there for several days at a time. 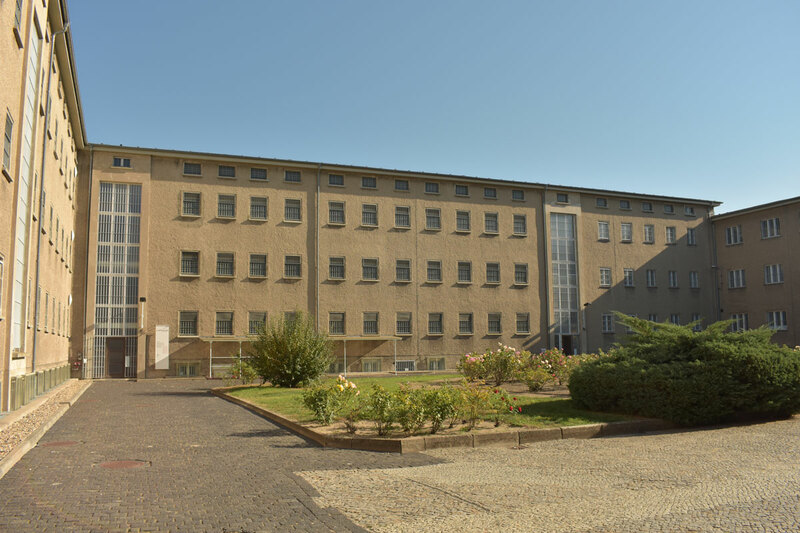 In 1951, shortly after the East German Ministry for State Security – more commonly known as the Stasi – was founded, they took over the former Soviet cellar prison at Hohenschönhausen and established it as their central site of remand. During the 1950s over 11,000 people were imprisoned there on account of their purported opposition to the communist dictatorship that now ran the GDR. Initially, the Stasi employed methods of physical torture similar to those used by the Soviets. As our guide led us out of the submarine, though, and towards a large concrete building that wrapped around three sides of a courtyard, she outlined a shift in the Stasi policy towards the political prisoners under their control. The new prison was built in the 1960s and unlike the Submarine all cells were above ground. Our guide invited us to consider how on the surface the conditions in the new prison were more pleasant. There were windows to let in light. Cells were kept clean. Prisoners had their own room complete with bed, blankets and flushing toilet. The tranquillity, our guide stressed, was skin deep. By this point the Stasi machine had expanded considerably. Officially a democratic government and keen to become a player on the global stage, the GDR no longer wished to be associated with the punitive measures meted out in the submarine, and so the new prison marked a shift from physical torture to a project of psychological debilitation. Our guide highlighted five methods through which this was achieved: disorientation, isolation, sleep deprivation, humiliation, and interrogation. Often persecuting suspects without witnesses or evidence, the Stasi required confessions in order to secure a legal conviction. Rather than beat it out of them, the new prison at Berlin Hohenschönhausen broke political prisoners mentally until they agreed to sign confessions for crimes they did not commit. Standing in a former interrogation room our guide explained how Stasi interrogations were procedures of intense drama, carefully constructed to destabilise inmates until they felt powerless and forced to comply. It was here that our guide emphasised the key role of surveillance. She explained how the Stasi made it their business to know everything about any inmate and that this information played a key part in the course of an interrogation. She described how an interrogator might calmly ask an inmate what football team they supported before pointing to the wall where a photograph of that team was already displayed. This was not, as suggested, a coincidence, but rather a way for the Stasi to demonstrate their complete knowledge of the inmate, to destabilize them, to convince them there was no one they could trust. Surveillance was all about the Stasi positioning themselves as the powerful and the inmates being powerless. We left Berlin Hohenschönhausen slightly numb and took the tram to Prenzlauer Berg in search of beer and falafel. As we were eating, I absentmindedly scrolled through the news on my phone. The first headline announced that 50 million Facebook users had just had their accounts hacked. The hack, believed to be the largest in Facebook’s history, was discovered by Facebook engineers; affected customers were automatically logged out of their accounts and required to log back in and change their passwords. It soon emerged, though, that the situation was more serious and a wide variety of accounts had been compromised. Apart from hoarding Facebook login details, the hackers also stole tokens, a short unique string of letters and numbers that allows you to log in to other apps and websites through your Facebook account without entering a password. This meant that data breach extended beyond personal Facebook accounts to more specific applications such as Spotify, Pinterest and Yelp. Facebook managed to disable the feature and changed the tokens so that when users logged back in new tokens would secure fresh access.2 They also sought to reassure users that such problems would not occur again. Mark Zuckerberg declared that he was “glad we found and fixed the vulnerability”. Still, as Zuckerberg himself pointed out, “it definitely is an issue that this happened in the first place”.3 Several other commentators went further, highlighting the dangers inherent in using third-party authentication systems such as Facebook, Google or Twitter. On top of this is the fact that during the breach personal data could be extracted, including personal interests, likes, dislikes, music choices, personal photos, political opinions, favourite football teams. During our meal we remembered the guide at Hohenschönhausen explaining how in 1989, when the Stasi was shut down, it employed 90,000 people, with more than the same again employed less formally as informants. This level of man power, our guide explained, was necessary to achieve the surveillance the Stasi used to control the population. Today, though, in the wake of the Facebook security breach, it seemed unlikely that it would require a staff of 90,000 to find out which football team someone supported. All that information is already collected. Daniel Ellsberg is no stranger to surveillance culture and its compromises. As a young man he was employed by the RAND corporation and worked on nuclear strategy during the Cold War. By 1969, however, Ellsberg had become disaffected with the war in Vietnam and with the help of a former RAND Corporation colleague, Anthony Russo, they made secret photocopies of classified documents that became known as The Pentagon Papers. The documents they released essentially demonstrated that the government had known since the early years of the conflict that the war in Vietnam could not be won. In 1971 The New York Times tried to publish some of the papers only to be blocked by Nixon’s administration. By the time the papers were published later that month, Ellsberg had publicly admitted his role in their release. Ellsberg has continued his activism ever since, involving himself in the anti-war protests at the turn of the century and, as cited above, pledging his support for other American whistleblowers. If our visit to Hohenschönhausen highlighted the dark potential of mass surveillance and the Facebook data breach exemplified our vulnerability, the concrete building with green panels perhaps reminds us of the infrastructures necessary to put such measures into place. In particular it asks us to consider where exactly the surveillance is being done and who the surveillance is done for. The messages emanating from Facebook sought to position themselves as victims. “I think this underscores the attacks that our community and our services face”, Mark Zuckerberg said.9 Yet, it is the likes of Facebook – not the hackers – who have control of the infrastructure through which digital surveillance is made possible and it is Facebook – not the hackers – to whom we bequeath our personal information every day. Only last week it was announced that another internet giant, Google, and the telecoms firm, Orange were teaming up to build a private undersea cable that connects the coast of France with the US.10 In recent years, Google have been building a number of such private cables, which they claim provide better performance for their customers. Such private cables also give Google complete control over the data traffic they compute. Just as the tokens used by Facebook allow them to position themselves as the interface through which all our online activity is accessed, the undersea cables constructed by Google would appear to be part of an effort to ensure that everything done online is done on their watch. 1My history and description of the prison site at Hohenschönhausen is taken largely from www.stiftung-hsh.de/history/restricted-district/ as well as my own notes. 2Dan Tynan, “Huge Facebook breach leaves thousands of other apps vulnerable,” The Guardian, 3 October, 2018, www.theguardian.com/technology/2018/oct/02/facebook-hack-compromised-accounts-tokens. 3Julia Carrie Wong, “Facebook says nearly 50m users compromised in huge security breach,” The Guardian, 29 September, 2018, www.theguardian.com/technology/2018/sep/28/facebook-50-million-user-accounts-security-berach. 4Das Leben der Anderen. Directed by Florian Henckel von Donnersmarck. Germany: Wiedemann & Berg, 2006. 5Brad Friedman, “Daniel Ellsberg: Edward Snowden is a patriot,” 14 June, 2013, Salon.com. 7James Bridle, New Dark Age: Technology and the End of the Future (London & New York: Verso, 2018), 7. 9Wong, “Facebook says nearly 50m users compromised in huge security breach”. 10Alex Hern, “Google and Orange Building Cable Between US and France,” The Guardian, 15 October, 2018, www.theguardian.com/technology/2018/oct/15/google-orange-building-cable-between-us-france. 11Troy Wolverton, “The Facebook hack that exposed 30 million accounts shows we’re going to be dealing with the consequences of its ‘Move Fast’ motto for years to come,” Business Insider, 16 October, 2018, uk.businessinsider.com/facebook-hack-shows-again-the-downside-of-move-fast-and-break-things-2018-10?r=US&IR=T.